It has been over two months since super typhoon Haiyan devastated the eastern region of the Philippines and left massive devastation to livelihood and lives. Throughout this time, our communities have come together to help out in solidarity with the typhoon survivors. Anakbayan NJ recently initiated Taskforce Haiyan NJ, part of a national network that campaigns for sustained fundraising and relief for the Philippines. 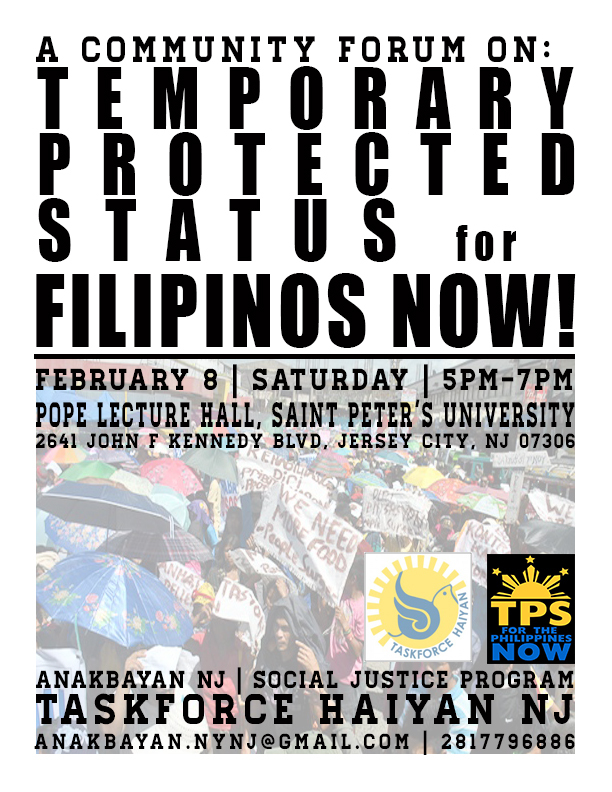 We are inviting you to learn about Temporary Protected Status (TPS) for Filipinos Now Campaign, and how you can get involved. *If granted by the Department of Homeland Security, TPS would grant immigration relief to Filipinos here in the U.S. One of the objectives of the campaign is extensive public education to address the Filipino community’s concerns about the possible program. On behalf of the Taskforce, we would like to invite you to a public educational forum being held on the 3rd month since Super Typhoon Haiyan hit the Philippines.